Significant capacity to produce specially developed wood reinforcements for cost-effective plastic compounds will go online later this year for automotive applications under development. In a presentation at the Society of Plastics Engineers Automotive Composites Conference & Exhibition (Troy, MI), Jeffrey Cernohous, chairman and founder of Interfacial Solutions, said new equipment to produce a composite material designed in collaboration with Weyerhaeuser is currently being installed and will have a production capacity of 2,500 pounds per hour. Interfacial Solutions is a nine-year old product development company based in River Falls, WI. 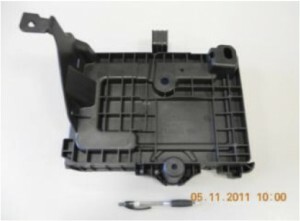 Weyerhaeuser and its lead users have conducted an extensive number of commercial injection molding trials for the targeted automotive applications, which were not disclosed. Interfacial Solutions operates an 85-ton Engel in its process development lab to enable early prototyping. Loadings levels under investigation are 20%, 30%, 40%, and 70%. Target plastics include polyolefins, biopolymers and polyvinyl chloride. Weyerhaeuser is already a major supplier of cellulose fiber and wood products to many industries. The new project with Interfacial Solutions targets further applications for Weyerhaeuser’s cellulose fiber in the plastics market. While WPCs are widely used in non structural decking and fence applications, they are still not as strong as pine and cedar, while also being more expensive and heavier. “Additionally, these materials lack the ductility required to displace conventional plastics and composites utilized in the automotive industry,” Cernohous stated in his submitted abstract. “We believe that there is a need for cost effective natural fiber composites that have improved mechanical properties.” The particular target is to provide a natural fiber-reinforced polyolefin that could replace expensive glass-reinforced engineering plastics. Cernohous made a presentation on moisture-resistant technologies for wood composites at Antec 2012 held last April in Orlando, Fla. When composites with high fiber content are in humid environments they can absorb as much as 10% if their mass in moisture. High moisture content reduces the compound’s dimensional stability, color fastness, and microbial resistance. Interfacial Solutions has developed proprietary technologies to improve the moisture resistance at room temperature and elevated temperatures. The company has also developed a moisture scavenger technology that eliminates the need for pre-drying natural fibers and other moisture sensitive plastics prior to processing. The cellulose fiber reinforcement materials will be dried at the compounding site and shipped in sealed containers. Cernohous said the company is working on technology that will allow the new cellulose fiber reinforcement to be added press-side at an injection molding plant.